If it's clear Wednesday night and Thursday before dawn, keep a lookout high overhead for the "shooting stars" of the Geminid meteor shower. That's the peak night for this annual display. 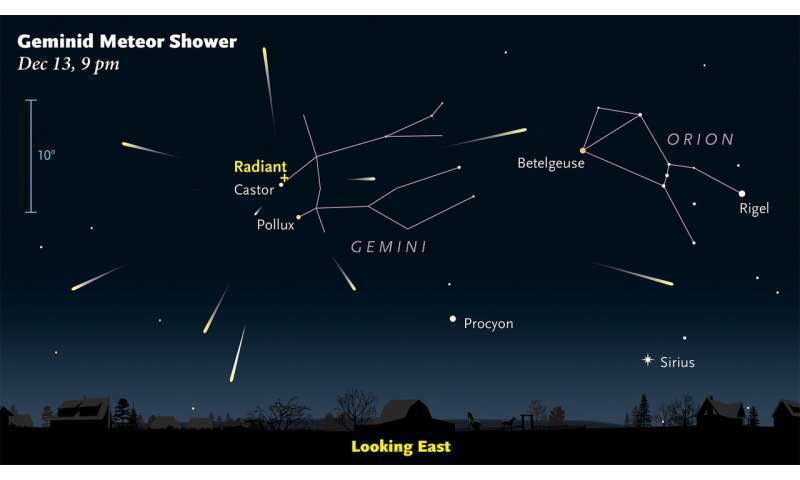 "The Geminids are usually one of the two best meteor showers of the year," says Alan MacRobert, senior editor at Sky & Telescope. 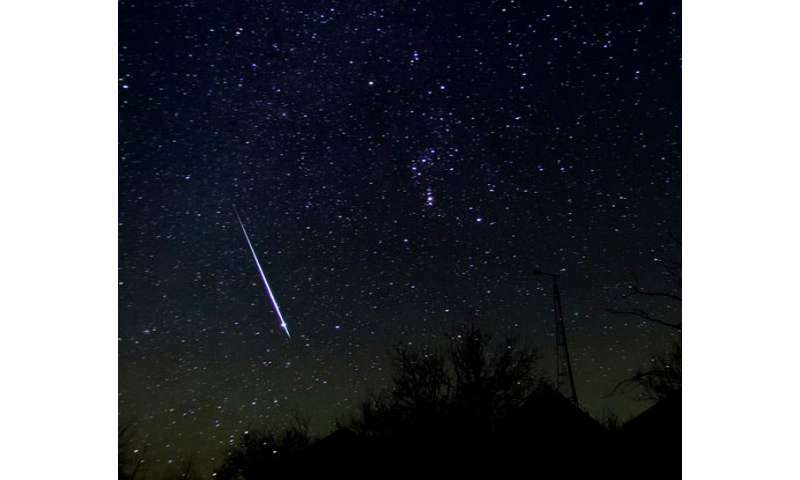 "Sometimes they're more impressive than the better-known Perseids of August." If it's cloudy on the night of the peak, some Geminid meteors should still be visible for a few nights before and after the peak. If you live under the artificial skyglow of light pollution, you'll see fewer meteors overall, but the brightest ones will shine through. This year there'll be no interference from a thin waning crescent moon, which doesn't rise until after 3 a.m.
To watch for meteors, you need no equipment other than your eyes. But you'll see more of them if you allow at least 20 minutes for your eyes to adapt to the darkness. Find a dark spot with an open view of the sky and no glaring lights nearby. Bundle up as warmly as you can in many layers. "Go out late in the evening, lie back in a reclining lawn chair, and gaze up into the stars," advises MacRobert. "Be patient." If you trace each meteor's direction of flight backward far enough across the sky, you'll find that this imaginary line crosses a spot in the constellation Gemini near the stars Castor and Pollux. Gemini is low in the eastern sky during late evening and climbs to high overhead in the hours after midnight (for skywatchers at north temperate latitudes). This special spot is called the shower's radiant. It's the perspective point from which all the Geminids, which travel in parallel through space, would appear to come if you could see them approaching from far away. "Don't fixate on looking toward Gemini," advises S&T senior editor Kelly Beatty. "Geminids can appear anywhere in the sky, so the best direction to watch is wherever your sky is darkest, which is probably straight up." Small particles create tiny, quick streaks. The occasional bright one might leave a brief train of glowing smoke. 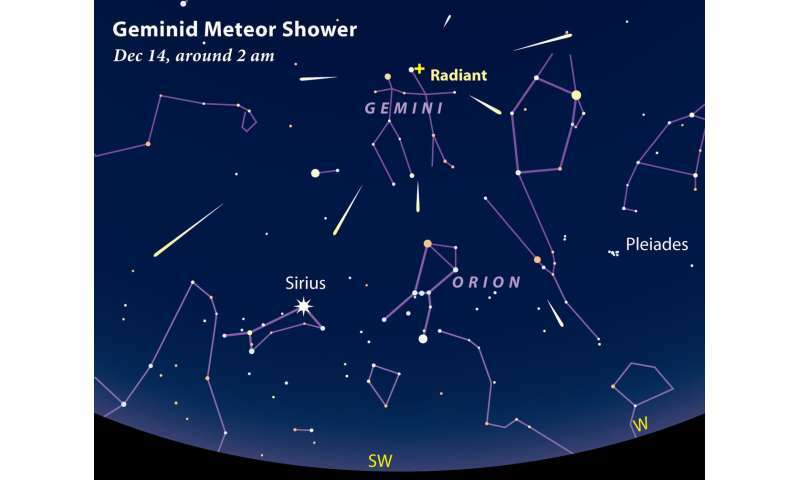 You can start looking for this shower's meteors as early as 7 p.m., roughly 3 hours after sunset, because by then the constellation Gemini has risen over the eastern horizon. You'll see fewer meteors early in the evening, but they'll be longer, dramatic steaks continuing for a few seconds as they graze sideways through Earth's uppermost atmosphere. 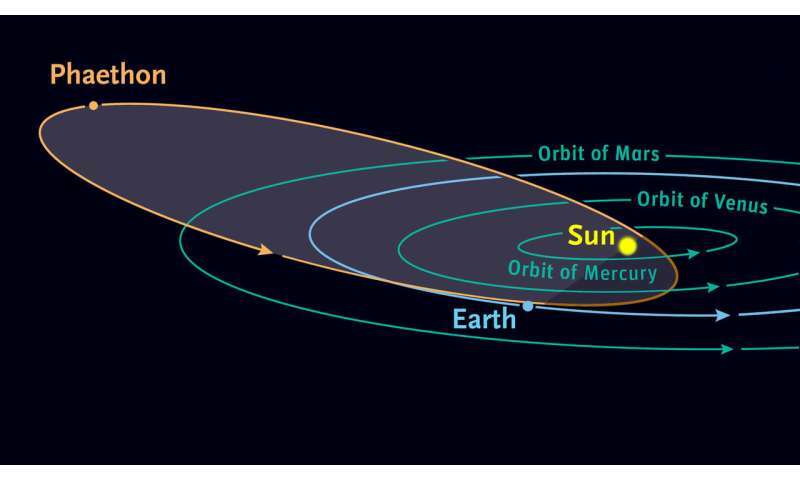 Phaethon is small, only about 3 miles across, and it loops around the sun every 1.4 years in an orbit that approaches the sun closer than any other known asteroid. Some researchers call Phaethon a "rock comet" that sheds dusty debris each time it nears the sun, when its surface becomes heated to roughly 1,300°F (700°C). Over the centuries, these bits of Phaethon have spread all along the asteroid's orbit to form a sparse, moving "river of rubble" that Earth passes through in mid-December each year. The particles are traveling 22 miles per second (79,000 mph) with respect to Earth at the place in space where we encounter them. So when one of them dives into Earth's upper atmosphere, about 50 to 80 miles up, air friction vaporizes it in a quick, white-hot streak. By coincidence, Phaethon itself is passing its closest Earth in mid-December and will appear its brightest one night after the Geminid maximum. But this visitor will still be quite faint, about 11th magnitude, which requires a moderate-size backyard telescope to see well. Go to www.skyandtelescope.com/observing/3200-phaethon/ for more information about this appearance and detailed sky charts for finding it in the sky. Light pollution in the sky doesn't interfere just with meteor watching. It's the bane of everyone from backyard nature lovers to professional deep-space researchers. But most light pollution is unnecessary. It results from wasted light beamed uselessly sideways or upward from all of the poorly designed and improperly aimed outdoor lighting for many miles around. This waste can be prevented by installing modern, fully shielded fixtures, and by aiming fixtures more downward toward the ground where the light is wanted. These simple steps not only reduce light pollution in the sky but also allow great savings of electricity. "Be aware that some LED fixtures emit harsh, blue-hued light that makes it especially difficult to see the stars," notes Beatty. To avoid this harshness, the International Dark-Sky Association recommends that you install LEDs with a "color temperature" (marked on the packaging) that's no greater than 3000K.